Planning for the Unplanned – Where is Lydia? The plan for the unplanned trip was to buy a one way ticket to Mexico City – wing it, go wherever the wind takes me, find myself. 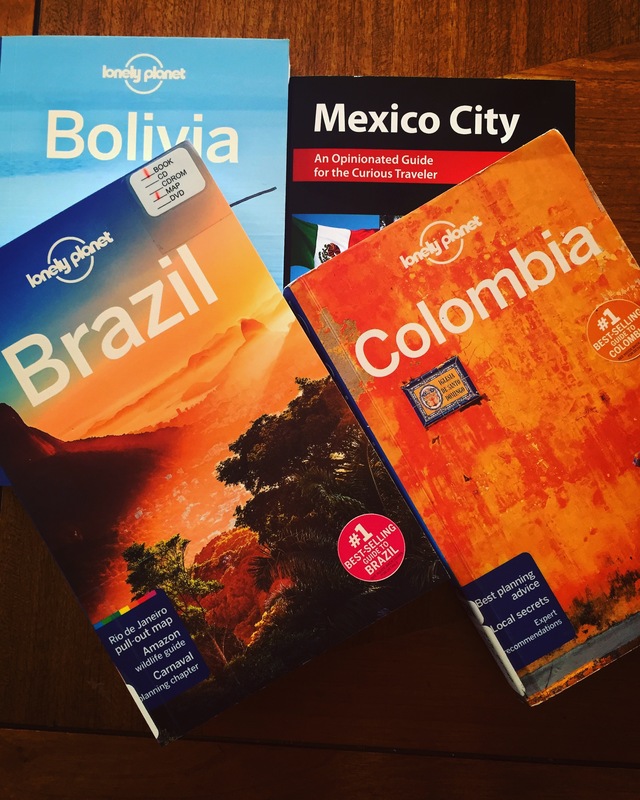 I checked out travel guides from the library on every country in South America an d began researching. I’m a little embarrassed to admit that, but I knew almost nothing about South America. I assumed it was similar to Central America in the sense that it was tropical and cheap. I’m glad I had enough sense to do a little research before. Over the past few weeks I have been studying prices and climates for places like Brazil, Argentina and Chile. During that time, I found that you need to apply and purchase visas ahead of time to enter certain countries like Bolivia and Brazil. You also need to show a point of exit ticket from South America when boarding flights. It appeared my plan to wing it was being stifled. I guess they want you to leave eventually. At this point, I began stressing over my itinerary. I had planned to make Columbia my second stop after Mexico in October and then continue on down the continent. According to my research, October and November are two of the wettest months in Columbia. November is the beginning of the rainy season in Bolivia. What happened to my tropical paradise? If I wanted to include Bolivia in my trip, I would need to go before November. The capital of Bolivia, La Paz, has the highest altitude of any capital in the world. Many people suffer from elevation sickness upon arriving and need a few days to recover. With Bolivia being both high in altitude and mountainous, the capital hardly peaks 60° and freezing temperatures often accompany nightfall. My vision of wearing a sundress and lounging around in my bikini was vanishing. Brazil’s warm season starts in D ecember when prices start to soar. November is the beginning of the summer for Argentina and Chile – and prices follow suit. Those moments of beachside bliss came with a hefty fee. It was time for a new plan of attack. I would change my itinerary to start in Bolivia then head to Brazil, Argentina, and Chile – upward to Peru, Ecuador and finally reaching Columbia come March. Unfortunately, this new scheme left me at a loss. I would have to suffer either Columbia or Peru’s wet season. Scheduling was forcing me to choose. I couldn’t have it both ways. There was also no way to know how accurate those travel guides were in regards to weather. My head was spinning. The relaxed go with the flow, finding myself adventure had turned into a huge stressor in my life. It completely consumed me and I’m sure annoyed everyone around me because it was all I could talk about. list of criteria was climate. Coming from a cold and rainy Seattle, my preference is to vacation somewhere warm. While the Uyuni Salt Flats in Bolivia looked amazing, the idea of being freezing cold at night just didn’t sound like a relaxing time to me. In the past when planning my travels, I usually do very little research on the country I am planning to visit. My requirements don’t venture far from price and weather. If those things check out, I buy the ticket and start planning and saving after. Brazil and Columbia ha ve always been two countries I’ve found intriguing. I started reading a guide on Brazil and immediately fell in love with the country. It fits all my requirements and so much more. Their history is so rich due to their melting pot of ethnicities, cultures and traditions. This coupled with their rich biodiversity sold me. It’s also huge country and not something that can be fully experienced on the go. The idea of staying in both Brazil and Columbia for three months started to sound very appealing. I could, in true Latin American style, take my time. I would have the time to soak it all in and immerse myself in the culture. I wouldn’t feel rushed to tackle a handful countries in six months. My family and friends kept reassuring me that I can always go back. This won’t be the only opportunity to travel to South America. Now that the fantasy of spontaneity has eroded into careful thought, I vowed not to stress out about the details. Anyway, all I know for now is my first stop will be Mexico City and then on to Rio de Janeiro. I better to get to working on my Samba and Portuguese.